We have lost yet another member of our FFGR, Inc. family. Karma was adopted in 2006 by Deanne McClintock. Deanne and Bill traveled the train to Washington, D.C. together and they shared many dog stories. When Deanne retired (along with Rick), they submitted their application to our group to adopt a greyhound. 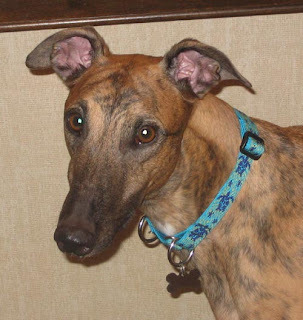 Although Deanne had been a breeder and trainer for many years, she fell in love with the greyhounds we brought in and decided to adopt one. Karma was her (and Rick’s) best friend and retirement buddy for a very long time. He was greatly loved by Rick and the two would take walks together. Karma started limping a few weeks ago and he was diagnosed by his vet with cancer. It was too far advanced to do much of an intervention so they chose to give Karma all the love and attention they could until they determined that we was not enjoying his life. We are sad that Deanne and Rick lost their best friend, but we are gratified that Karma had such a wonderful and loving home. It’s all any dog could hope for.